Gordon Wallace, Collaborate or Commiserate !,ARC Centre of Excellence for Electromaterials Science (ACES) Intelligent Polymer Research Institute, AIIM Facility, Innovation Campus, University of Wollongong, 2013, 3p. The ability to build effective collaborative research activities is no longer a secondary skill for scientists. It is a skill critical to the development of a successful career. Without a demonstrated capacity to deliver on projects that mandate collaboration, a competitive position cannot be sustained. The importance of collaboration in delivering efficient, effective and high impact advances in research and innovation is well documented. 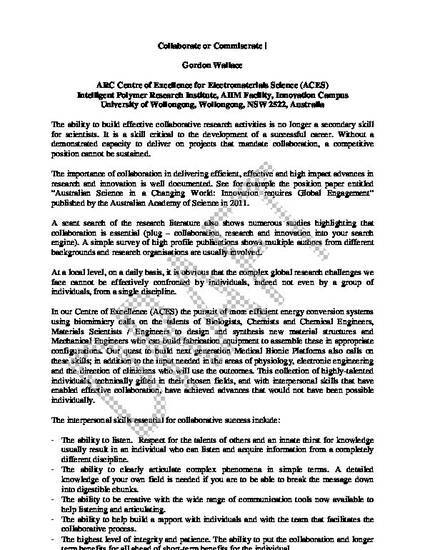 See for example the position paper entitled “Australian Science in a Changing World: Innovation requires Global Engagement” published by the Australian Academy of Science in 2011. A scant search of the research literature also shows numerous studies highlighting that collaboration is essential (plug – collaboration, research and innovation into your search engine). A simple survey of high profile publications shows multiple authors from different backgrounds and research organisations are usually involved.